"These always remind me of a wonderful food stylist friend who became addicted to banh mi when she was pregnant and, although we usually ate whatever food we were photographing in the studio, would send her assistant out to get them every day. They make a great barbecue dinner. " 1. Start by making the chilli mayonnaise. Combine all the ingredients, adjusting the chilli to taste; set aside. For the pickledcarrot, combine all the ingredients in a bowl, cover and set aside for 20 minutes. 2. Combine the pork, garlic, ginger, salt, pepper, salad onion and chilli. Roll into balls about 2.5cm in diameter. Heat a griddle pan over a high heat and drizzle with oil. Cook the meatballs, flattening them slightly, for about2 minutes on each side until cooked through. 3. 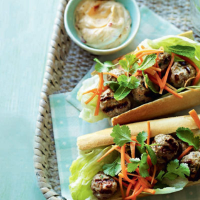 Slice the baguette into four and serve with the meatballs, lettuce, herbs, pickled carrot and the chilli mayonnaise.